Be a resource. Your Pinterest boards are a visually appealing way to organize links, articles, images, and videos that your followers may find inspirational, informative, entertaining, or useful. Keurig, Inc., the coffee machine manufacturers famous for their single cup brewing systems, has a board of unusual looking coffee mugs with well over two thousand followers, for example. Optimize your page for pinning. Now more than ever it’s important to have high quality images on your webpage or blog- it gives visitors something to pin. You can also install the “pin it” button, which is similar to the Facebook “like” or “share” buttons, near images of products or blog articles. Pin the human side of your business. Don’t forget to pin the photos of the people behind the scenes, the building where you work, and company events, milestones, and celebrations. Don’t be shy. Like other social media, Pinterest provides an opportunity to connect with your followers on a personal level. You can promote an interactive community by following users with similar interests, and commenting on, liking, or re-pinning the images of your followers. Collaborate. Pinterest allows you to add and edit images to a board as a group. Creating a themed board for your team can be a fun way to present different perspectives. Some businesses are also encouraging their followers to request an invitation to collaborate. Julie of Creekside Learning, a blog dedicated to providing resources for homeschoolers, founded a board of science projects for kids that has over 140 pins from 18 collaborators. Host a giveaway. Your followers can enter a lottery by liking, commenting, or re-pinning images on your boards. Last winter, Sunglass Warehouse asked users to create their own “Spring Break” boards and gave away free sunglasses to the best examples. Use infographics. They’re an effective and attractive way to communicate information to your followers on Pinterest’s highly visual platform. Don’t forget the video. Although images are more common, video can be pinned to boards as well. Your resource boards will be more useful if they include video tutorials and demonstrations. Invite your friends. Requesting an invitation from Pinterest can still take up to two weeks. Offer to send your followers on Facebook, Twitter, and Google+ invitations and they can begin following you through a new media platform immediately. Upgrade. There are now several tools and applications you can use with Pinterest. 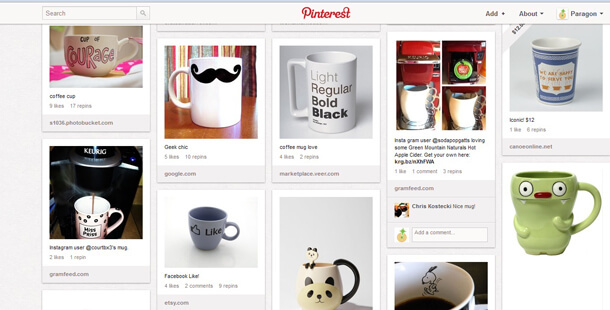 To start, you should definitely download Pinterest’s toolbar button that allows you to pin images when surfing the web. There are also a few useful third party applications, such as PinPuff, which analyzes your “pinfluence” and the effectiveness of your pins, or Pin Search, a Google Chrome extension which allows you to search for related links based upon a pinned photo. Make board art. Some of the coolest boards are like art in of themselves, a carefully chosen collage of images with a complimentary color scheme or a unifying theme. Check out this retro romantic board from Joy Cho/Oh Joy! Pin your stuff (thoughtfully). Pinning your own images from your blog or website is important for increasing awareness and driving traffic. However, your followers do not want to be bombarded with promotions and advertisements. Finding a balance in the content you pin is key. There you have it! Go forth and be amazing.